Once, our view of the economic health of Cleveland was centered on industry in areas like the Flats, rather than the “Euclid corridor.” We believed social wealth depended on the muscle and brains, the coordinated labor, the ingenuity and dedication of men and women who built our economy, who understood they were workers, and so built strong unions through which they won security, decent wages and dignified working conditions. 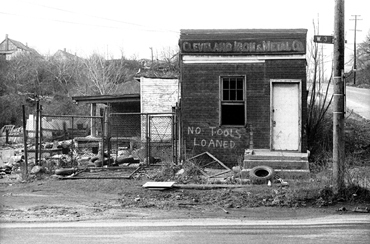 When I arrived here in 1970, things had already begun to change; Cleveland and Ohio had entered the decline toward the disastrous economic conditions that we have suffered recently. We have not yet recovered from the flight of industry to non-union areas of the southern United States and overseas in the 80s and 90s. Although objectively the glory years of Cleveland’s industrial base were already behind us when I arrived, there was still a great deal of manufacturing, transportation and other productive activity. I found the Flats an attractive photographic subject for its display of brain and muscle, teamwork and human effort. 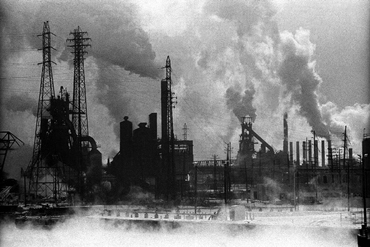 In the 70s and 80s I spent a lot of time in the Flats and other areas documenting the disappearing industrial landscape of our region and the paradoxical beauty it offered. Recently, I revisited those negatives, produced good scans, and have now made better prints with the new technologies than I ever could have before. One intention in revisiting this work is to produce something that might stimulate us to think about our history—Cleveland is a city that has happily destroyed much of the physical evidence of the great manufacturing and transportation industries that were at the heart of our city for decades. History seems to mean nothing to us. Steve Cagan lives in Cleveland, Ohio. He was born in New York City in 1943. HIs education was in English Literature (BA w/honors, City College) and US History (MA, Indiana University). He has been photographing and exhibiting seriously since the 1970s. Major work is in what is often called documentary, but what Steve prefers to call activist or socially-engaged photography. He has been centrally concerned with exploring strength and dignity in the everyday struggles of grassroots people to resist their pressures and problems.